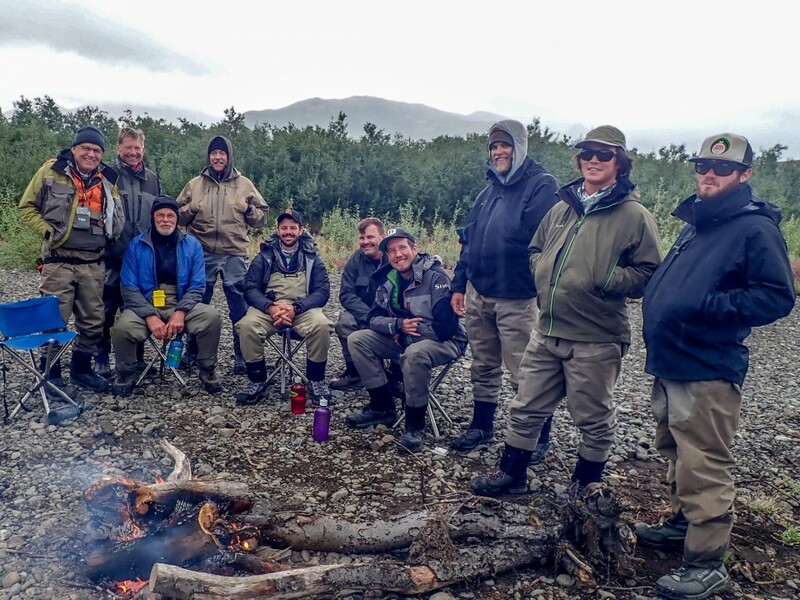 The Fertile Kanektok Fly-Fishing Trip with Fathers & Sons & Old Friends. 100 miles of Rainbow, Char, plus the Coho arrive! Perfect flying weather. Such magic to be airborne on a fine day. John Trachta rode co-pilot in the second Beaver flight with Gary Smith and Ted Schmidt. John, no doubt wishing that he was at the controls. 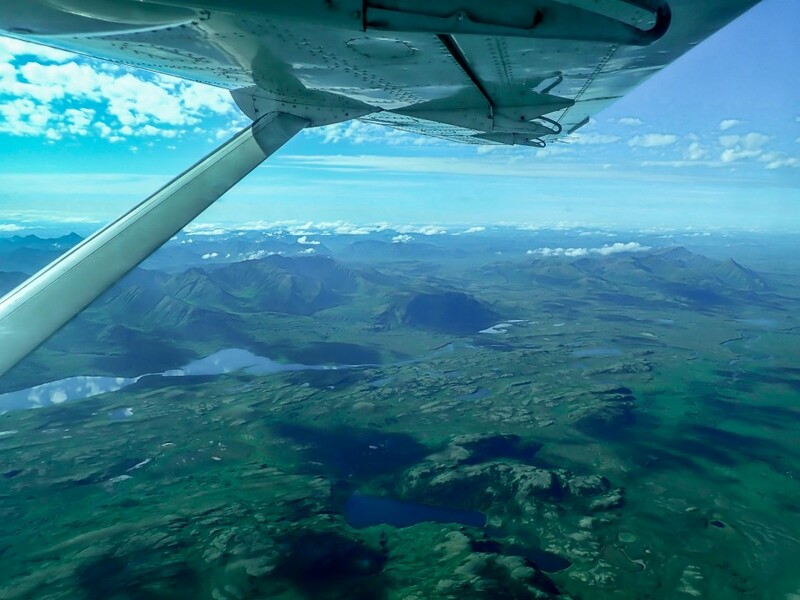 The rest of us boarded our respective flights and pressed our faces to the aircraft windows watching as the boreal forest tree line receded and the sub-arctic tundra landscape unfurled ahead. The planes flew through 2 mountain ranges and several passes and we watched for wildlife. John Jinishian, saw a Wolverine out the right window. 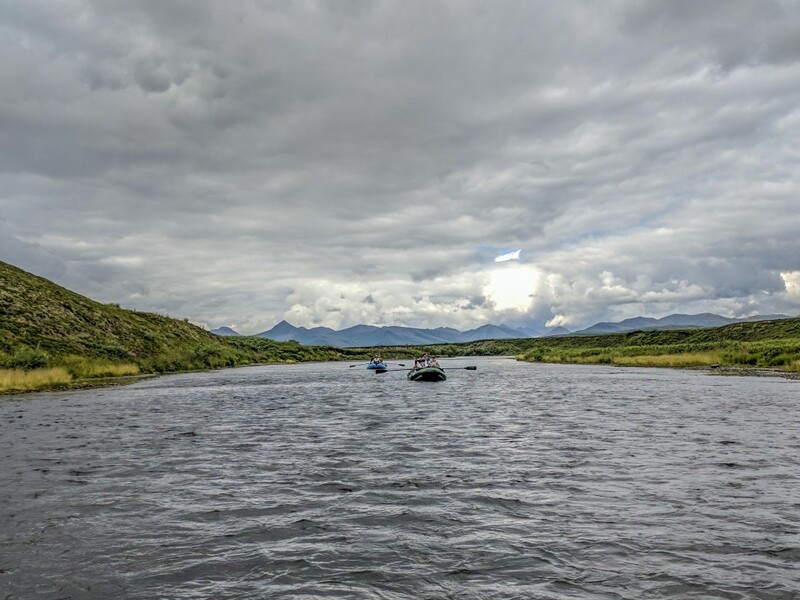 Our group of five old friends and 3 sons landed and rigged fly rods while the guides set up rafts then we piled aboard and headed down river. A 3 year old Brown Bear fished ahead of us for 15 minutes and could not be bothered to let us pass but kept ahead of us intent on the fishing. Meanwhile 2 immature Ravens, who had newly issued “learners permits” were practicing flying and landing with marginal control on a willow snag above the bear. 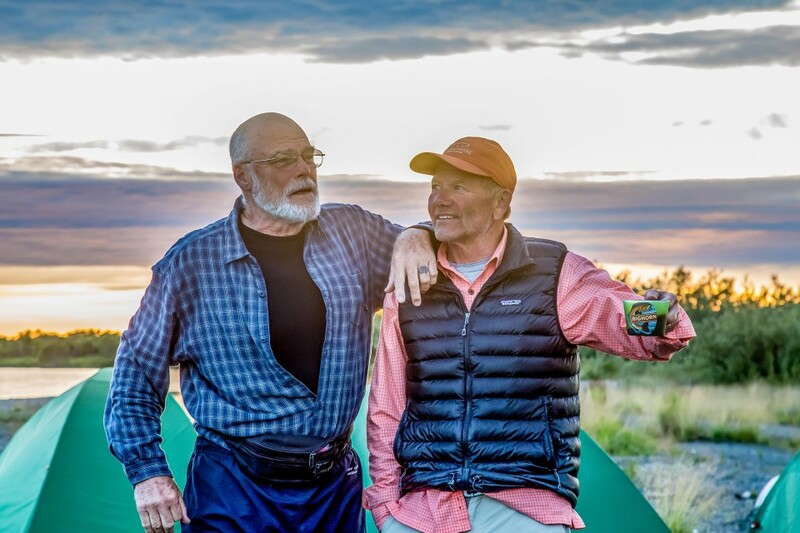 I rowed with Ted Schmidt and Floyd Bienstock and we passed thousands of Sockeye, some bright and newly arrived from the salt and others sexually mature- the “reds” of Red Salmon renown yet they were not seen spawning. Hundreds of pairs of Kings with white tails were passed. The tails white, because they have literally worn the skin, the epidermis, off in the athletic maneuvers of digging a nest out of gravel mid channel with their caudal fin. Likewise the Chums were in full spawning condition. We rowed though the alpine landscape and dealt with some shallow gravel bars in the upper river. The massive amount of gravel in those first miles is the river’s working and re-working of the 10,000 year old terminal glacial moraines. Some mountain valleys we saw were distinctly U shaped, and then we saw the most unusual postglacial natural feature: A large “glacial erratic boulder” in midstream. 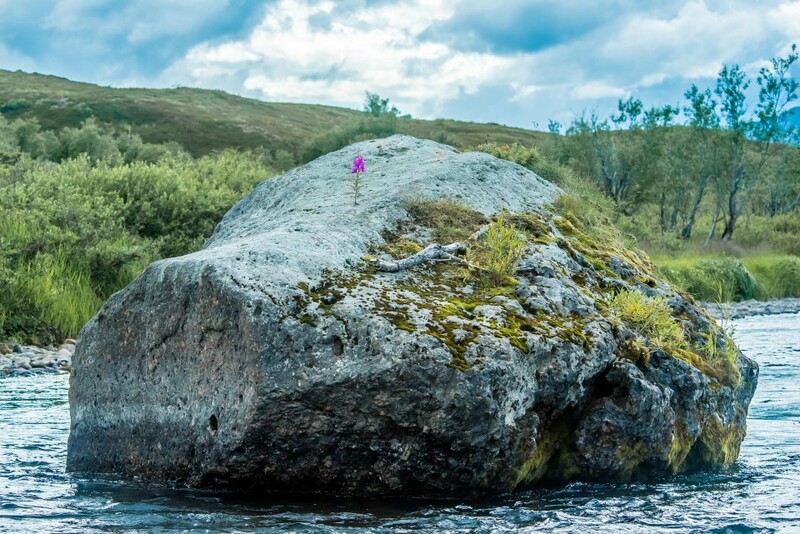 The upstream face was carved flat by ice but what drew our attention was a lone sprig of fireweed blooming on the raw rock surface. The riverbanks were littered with salmon carcasses. We passed a brood of tiny baby Harlequin ducks that seemed so young and vulnerable for mid summer. 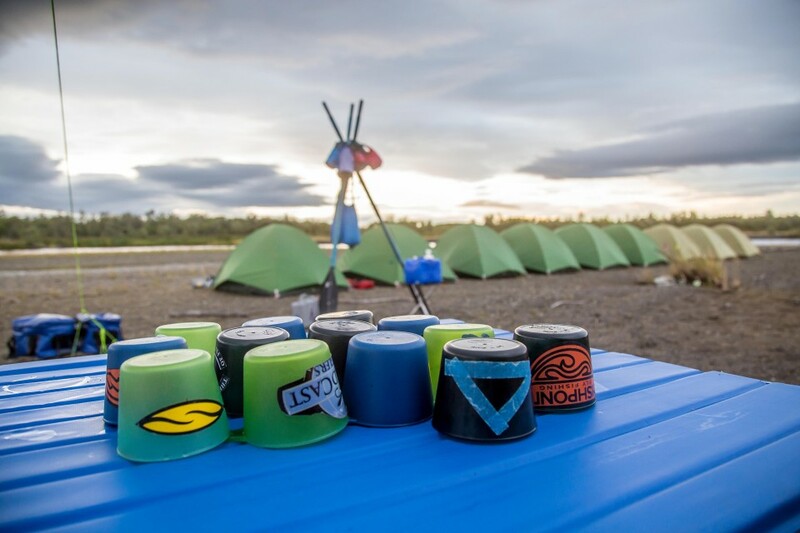 “At our first camp some very nice sea run Dolly Varden and Rainbow Trout were taken.” We cast streamers but they wanted trout beads so we switched to egg imitations. It was exciting to watch the large Char holding in place in the current above the red, and green and quartz pea gravel river bottom. The season was subtly changing from summer to autumn. The duration of the fair weather intervals between Bering Sea marine storms gets shorter by the week. By mid morning stratus clouds were layering down to mountain top level and the wind veered to the NE, which often foretells the approach of an arctic air mass aka cold front. We broke camp at 9:45 and I rowed with John Trachta and Jeff Michaels casting mouse patterns and each angler released 2 nice Rainbows and we watched the other rafts doing the same. The mountains scrolled by and the mist crept down slope, shrouding and then obscuring the shark tooth shaped mountains as the morning wore on. The upper Kanektok scenery was fabulous with knife-edge ridges that beg to be climbed as far as one could see. Mid day the cold drizzle began and we added layers of insulation at noon and took on as many calories as lunch could provide. 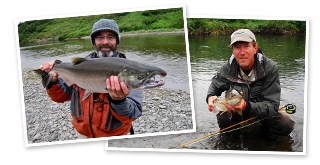 Lunch entertainment was provided by John and Jeff Michaels sight fishing a back channel to a large Rainbow and Floyd and Gary taking some spectacular Dolly Varden Char from the downstream end of the island. 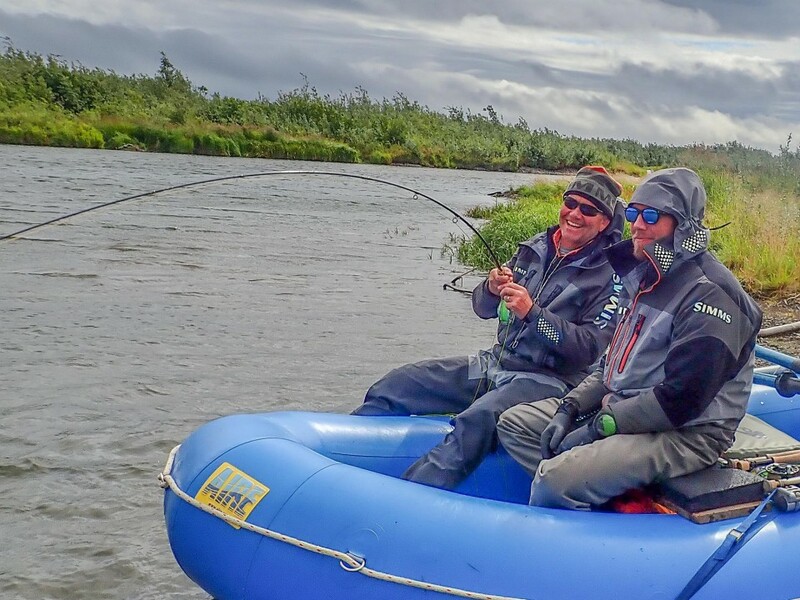 We passed a party of 3 rafts, outfitted from Bethel, Alaska who we’d meet again later under somewhat awkward circumstances in which they had become lost. Streamers with a trout bead on the leader were the ticket for a great many Rainbows and Char. Floyd took a lovely 26”inch Dolly! 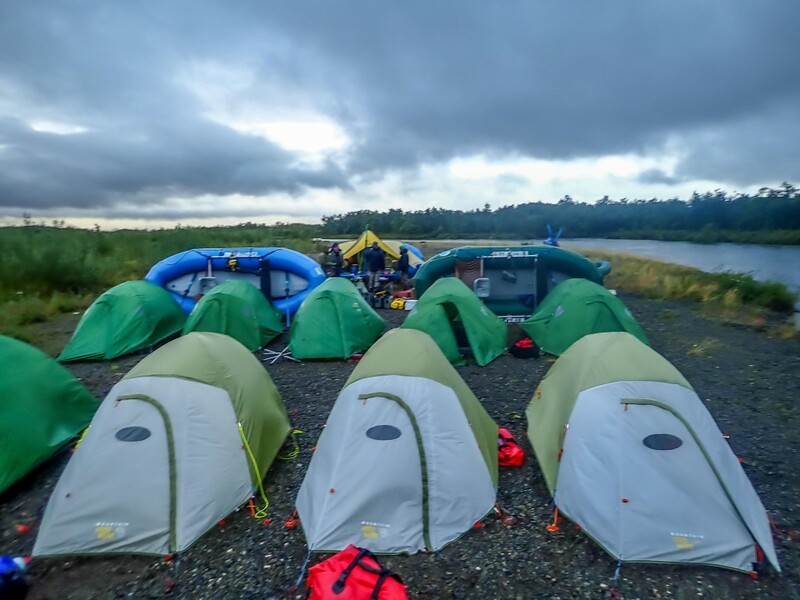 We capped off the day with a robust Sockeye Salmon fish taco dinner, some beverages, and slipped into our tents as the mist turned to light rain. The night passed with river noises and gentle snores. Light misting rain and gusty east winds to 15 mph made for difficult casting conditions. Hoods cinched tight we cast streamers and passed the time netting for one another. The fishing was beyond amazing! The Char eagerly took surface presentations/ gurglers, or beads, or streamers. Many multiple hookups on fish to 24. John Michaels lost a massive Char at the boat, which looked to exceed 30 inches and had an enormous girth. There were some words muttered under his breath of regret that he’d not put that one in the net, alas. Gary Smith had a solid day and not surprisingly Jeff Michaels, who continued fishing with great intensity was the high stick for the day. 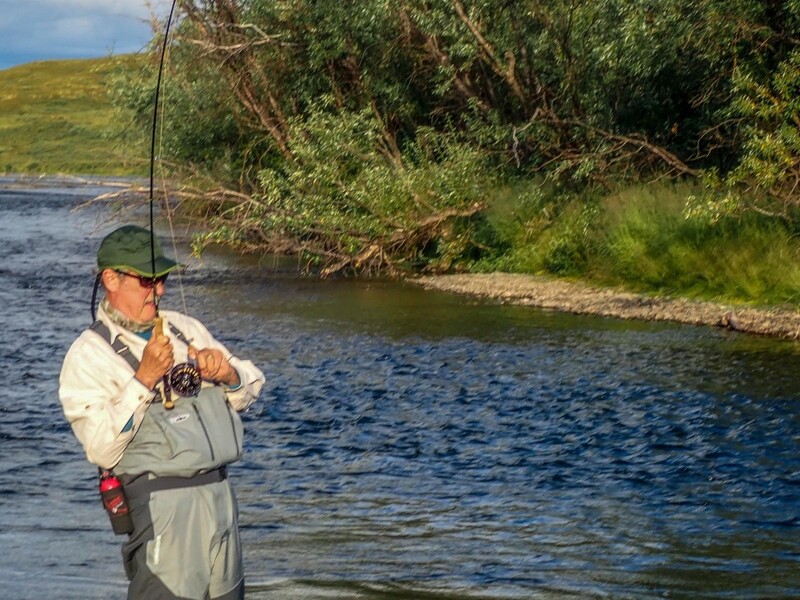 Overheard several times were the words “best day of fly fishing of my life!” But it was early in the trip. 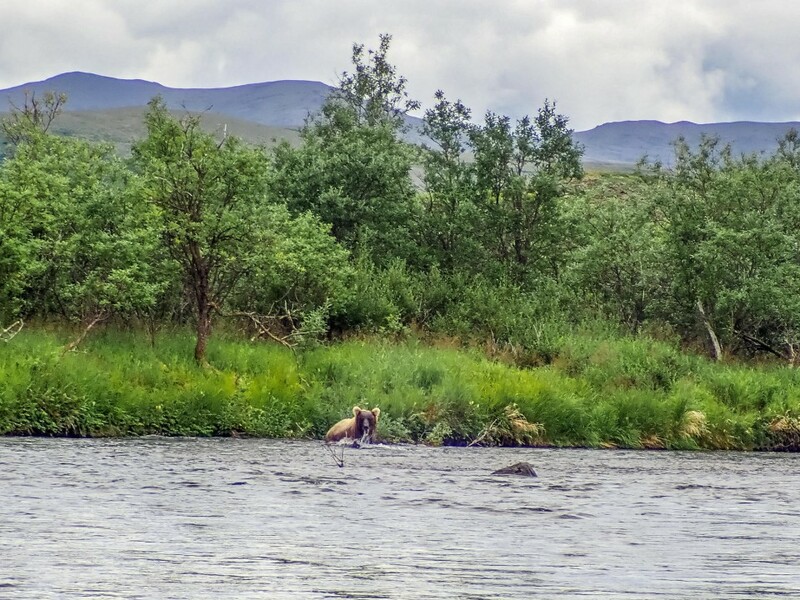 One Brown Bear was seen on the left bank and a Mink at very close range. A female Bald Eagle voiced her disapproval as we passed the nest in which we could see at least one nestling. A Merlin shrieked as we passed by and then pumped her wings and soared on the freshening breeze over the ridge. Pulling in to the camp that we call Falcon bluff the fishing was insanely strong and yet the wind was rising and we needed to build a storm proof camp so we got to work. A solid windbreak was erected to protect the “Wing” dining area and kitchen. Tents double staked and set to draft in each other’s wind lee. Then we were ready to enjoy John Jinishian’s spectacular pizza dinner. Halfway through the pizza party the wayward raft group from Bethel showed up, lost beyond reckoning and separated from their party and more importantly from their kitchen, with no way to communicate. We did what we always do: we invited them to dinner, shared the beer, and saw to their other safety and comfort needs, connected them by satellite telephone to their community and everyone turned into their tents as the rains intensified. The journal records wind gusts to 30 mph, steady light rain and the wind direction had veered to become a tail wind allowing us to make great headway through the mostly fishless “canyon stretch” past the weir. The water color decreased by the hour as the cumulative rain, washed algae off the gravel bars. The fishing was tough although it turned on for Rainbows and Char mid morning, died off midday, and then it was on again in the miles just before we made camp. 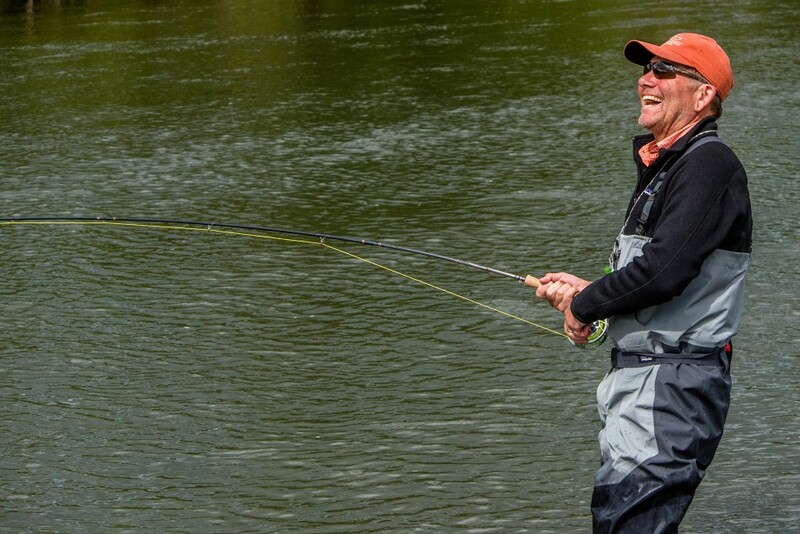 The wind took a toll on the casting arms of our anglers but they made the best of it. When we compared notes in camp it turned out that Ted and Floyd, fishing with Pete were “killing it” all day long with the Kilowatt, a blue and black colored streamer we’ve adopted from British Columbia steel-heading while some of the rest of the gang was “scratching along” with lesser flies. 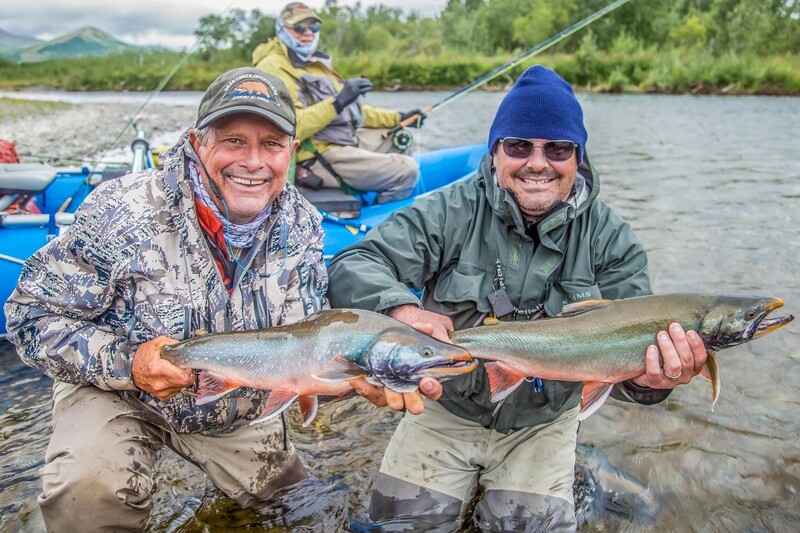 The log notes that Jeff took a spectacular Rainbow and released it. 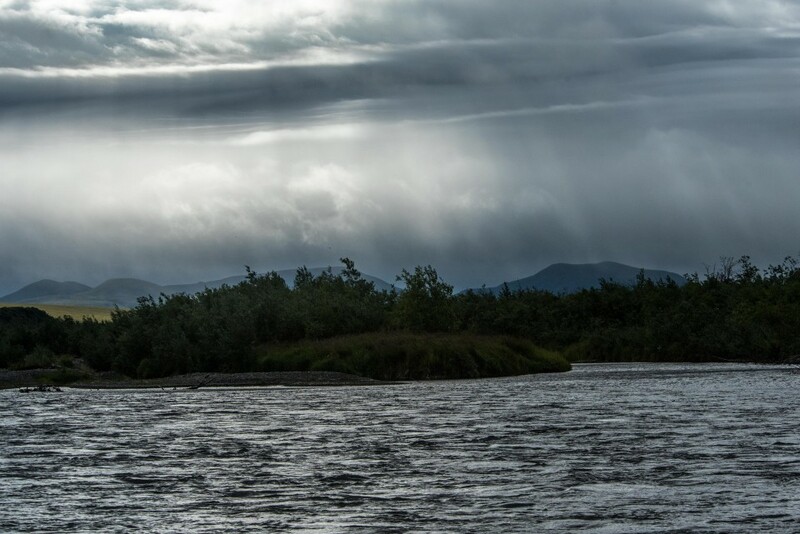 We left the mountains behind us after lunch and looked west and north across the vast coastal plain trying to get our heads around thousands of square miles of wet, windy, coastal, tundra stretching to the Kuskokwim Delta and beyond to the Yukon Delta. This land we looked upon was as flat as Kansas and contained hundreds of thousands of ponds, lakes, streams, sloughs, wetlands and rivers. This vast tundra wetland is where a huge percentage of North American waterfowl, Sand hill Cranes, and shorebirds raise their young. Camp this night included rafts rigged as windbreaks and all the tents drafting downwind. Against long odds the campfire team managed to get a fine fire lit and good cheer was had in its glow. This day marked the turn toward autumn weather-wise and in other ways. The birds of summer have migrated south for the most part. Our companions on the gravel bars, Semi-Palmated Plovers, Arctic Terns, Greater Yellowlegs were vastly reduced in number. The adult Harlequin ducks have gone to tidewater leaving broods of their young to fend for themselves. Snipe were no longer heard winnowing. 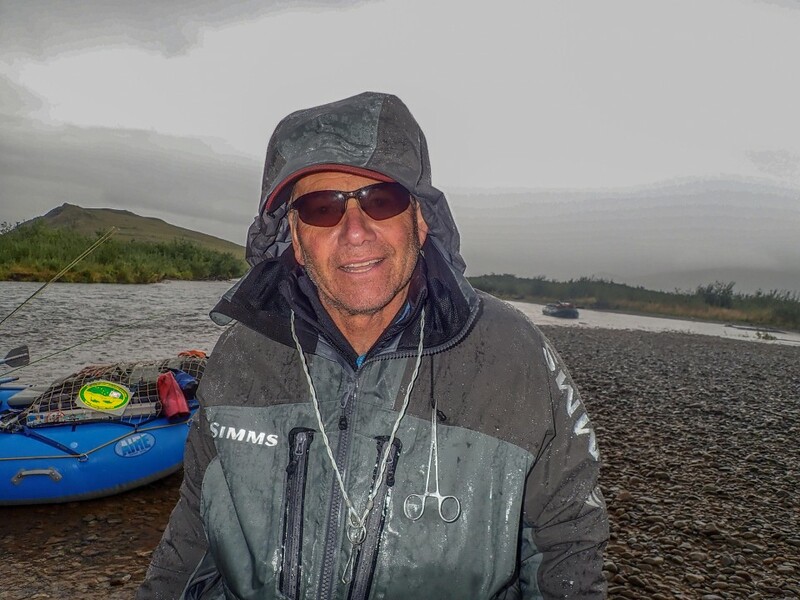 The river rose 2” in 12 hours and anglers worldwide know that can be the “kiss of death” in a weeklong rain. The water color has turned from Gin clear in the headwaters 4 days prior to “Dirty / Olive” by mid afternoon. The journal reports that the camp was “Ransacked” by the wind but held fast through the night. The winds tapered off as we had morning coffee. We had a peak of the sun at 9:00 am and birds began calling. Querulous Magpies called from the thickets, and a Kingfisher sallied forth from the bluff as we shoved off from camp and shortly thereafter it happened; the first Coho Salmon / Silver Salmon of the year was taken! Gary Smith was at once our hero and simultaneously a man to be envied! As the day passed more early Coho were landed and the streamer color of choice was pink! 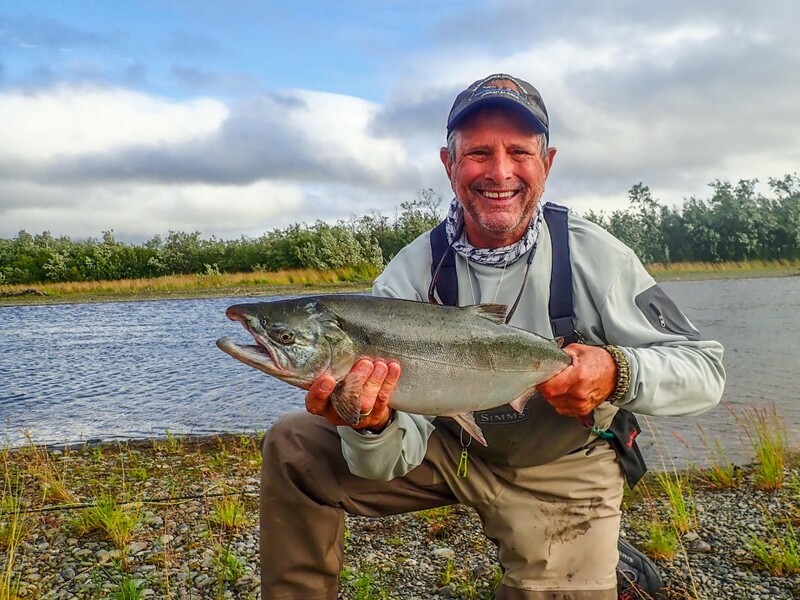 Once the Coho appear in numbers the Alaska fly fishing “game” changes dramatically. 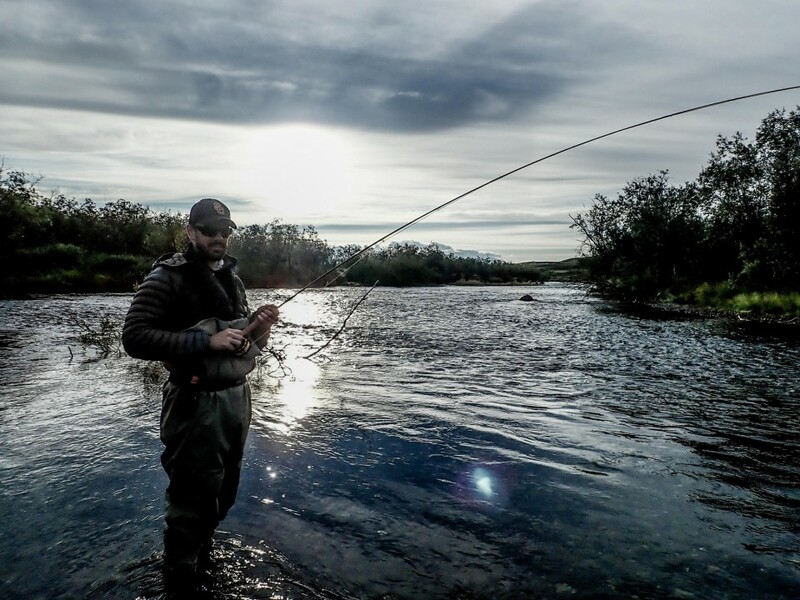 The fish are so aggressive to the fly and so powerful that all the #5 and #6 weight trout rods are quickly stowed and mostly forgotten and the streamer rods are taken up. 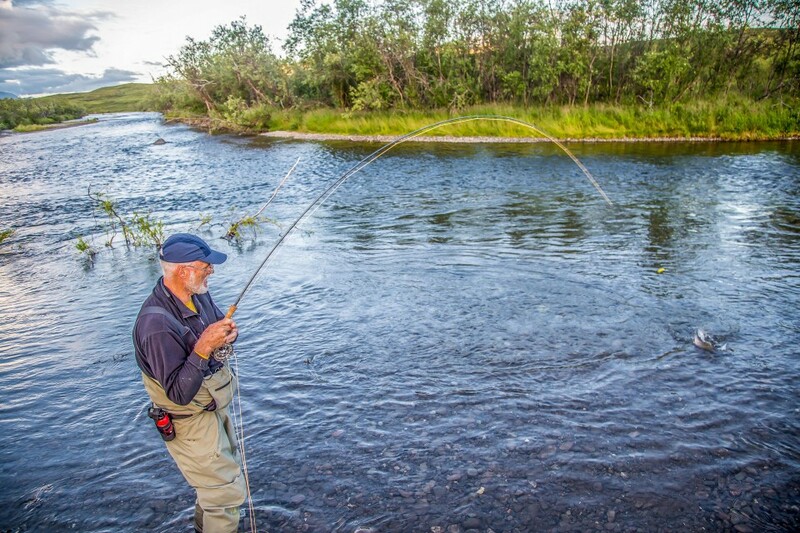 One hurls streamers with abandon, the gaudy pink and purple, or pink and white for hours in anticipation and then it sinks in that you are fishing for Coho in Trout water to no effect and so one picks up the trout rod again and fishes it, taking good fish, until a Coho pool or slough is reached, then switches rods. When one gets efficient at this change from one habitat to another then we experience the best of the trout/ Char and the best that the salmon have to offer! We stopped midday where some hiked to a bluff top while the rest of us grazed on Blueberries. The smell of “Labrador Tea” was compelling as we kneeled in the tundra scooping berries like Brown Bears. John Trachta proposed that we change tactics to focus on Coho and his premise was: A- the Coho are in the river system/ this being the first week of August when they traditionally arrive. B-They will be more numerous in the lower river while we are now in mid river. He posed this question: C-Shall we proceed to the lower river forthwith and target Coho? 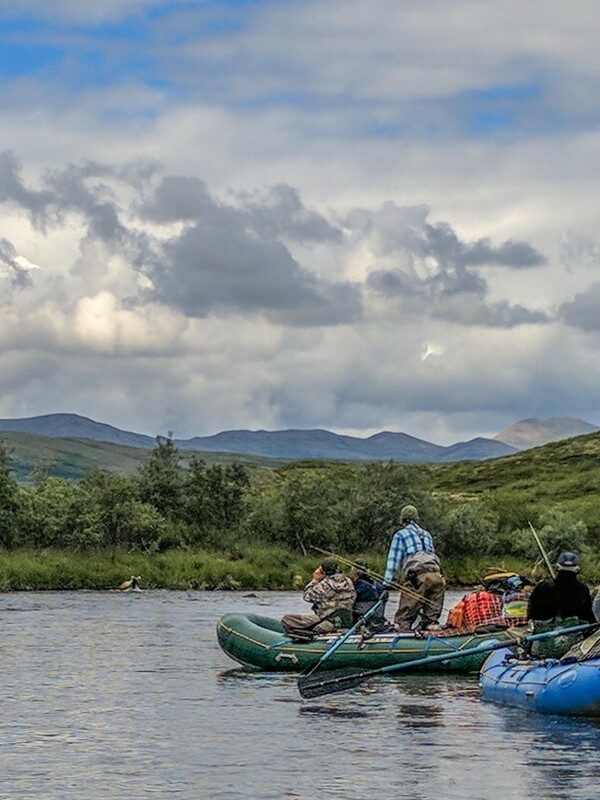 They’re being no objections we stowed rods and hastened downstream to focus on Coho Salmon. 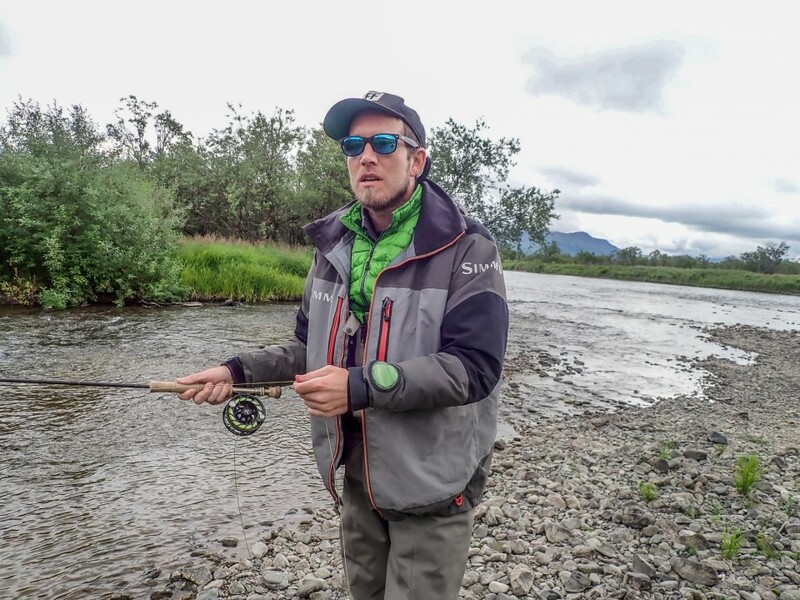 Now this tactic can seem simple in hindsight but it is not a given that the run will be strong in the lower river and one is making a commitment to stow the rods for a speed run to an uncertain fishery. I have seen this fail as I have also seen it succeed. 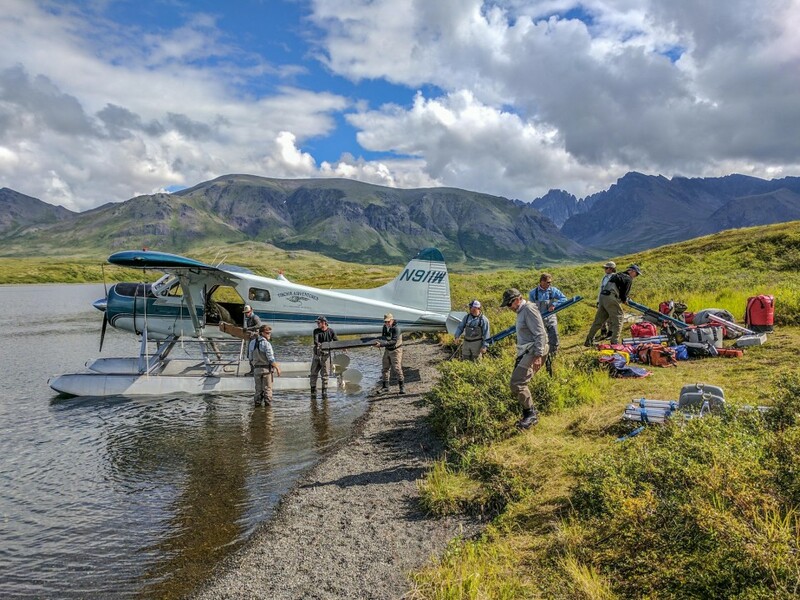 In any case this group has some Alaska mileage under their belts and they accepted the risk that the fishery might not be as robust as we hoped. We launched a speed run downstream for 18 miles to put us in position for tomorrow’s fishery. The wind overnight blew one raft windbreak down but the rest remained. The guides had a tough night in the wind. The storm continued with winds East North East at 20 mph. The cloud deck was low, only 500-1000’ above the river. The river rose again overnight another inch and the water color was turbid / olive. Their were peeks of blue sky, bits of sun, yet the willows were mostly bent horizontal in the wind with the underside of their leaves inverted with gusts and looking silvery. There were no easy Coho today. 11 were taken and one killed. 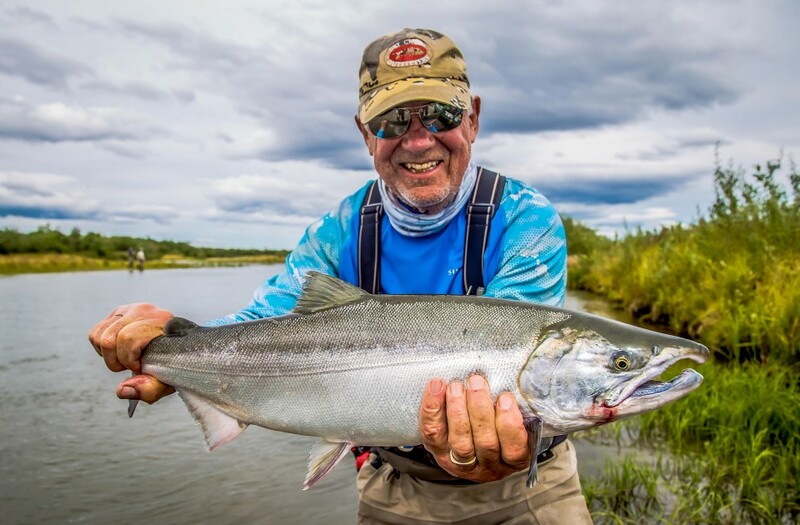 John Michaels took a brace of Coho below camp and another in a small river right side channel which he spotted holding under a mixed school of Chum & Sockeye. 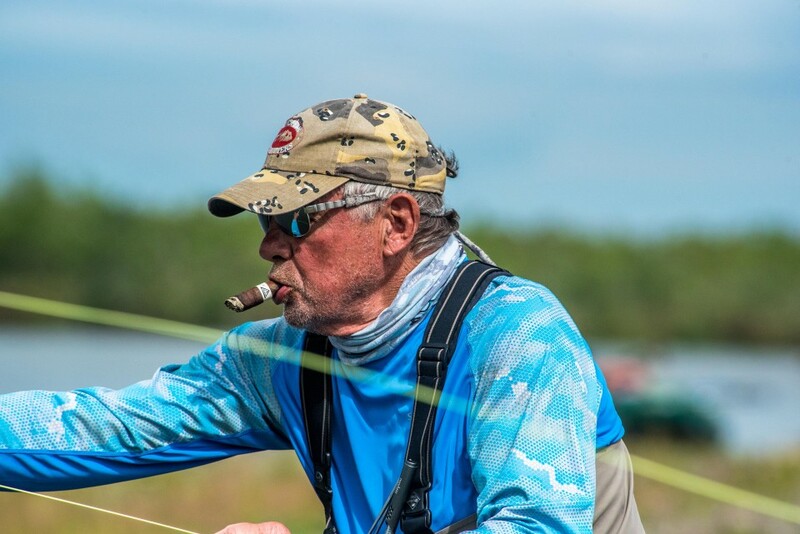 He patiently waited for the wind ripples to flatten allowing visibility and just right spatial opening then sight cast, connecting with that fish. Here 20 miles above tidewater the numbers of Coho were still modest and we moved all day in search. Still there was solace for anyone who switched to a Trout Bead. The Char were willing all day and Floyd and Jeff Michaels took as many as they wanted. Brian fished with Ted and his son Tyler and Ted killed a sushi grade Coho that was a great gift for the Sushi chef. The wind began to taper and the cloud mass was torn with blue streaks and the sun emerged after 5 days. The sound of the first small aircraft that afternoon reminded us how lucky we were to have flown out to begin our trip before the onset of the un-flyable storm. Like all the mornings this week I shared the sunrise with Ted Schmidt, who like me is an early riser and loves his coffee. We loaded boats and shoved off in anticipation. John Michaels fished with Jeff and me . John played a very large Rainbow, which was lost when I touched the leader. Like yesterday there were “No Gimmies”. Mid afternoon we pulled into a right hand slough system, beached our rafts and fished our way downstream to where we saw Floyd with his rod arched severely. When we reached him his comment was “I’m not a virgin anymore” and so began some of the most intense Coho fishing of 2017. 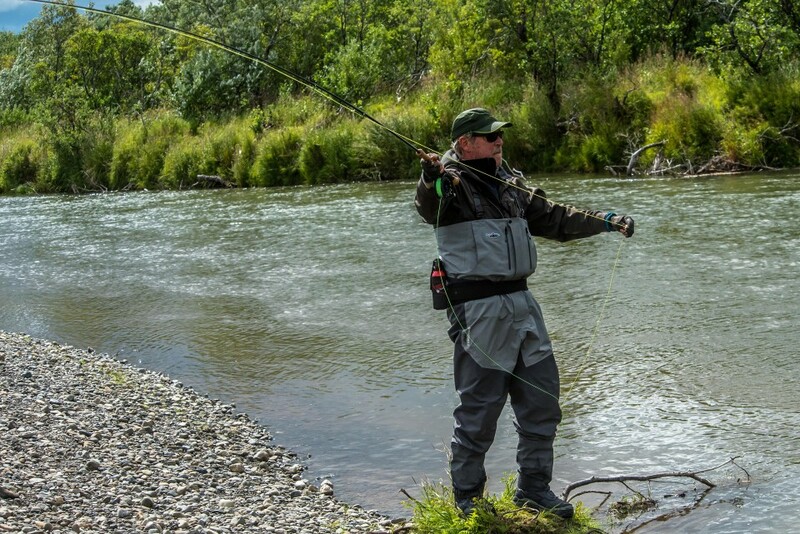 The fish were willing but required a perfect cast to within inches of the bank. 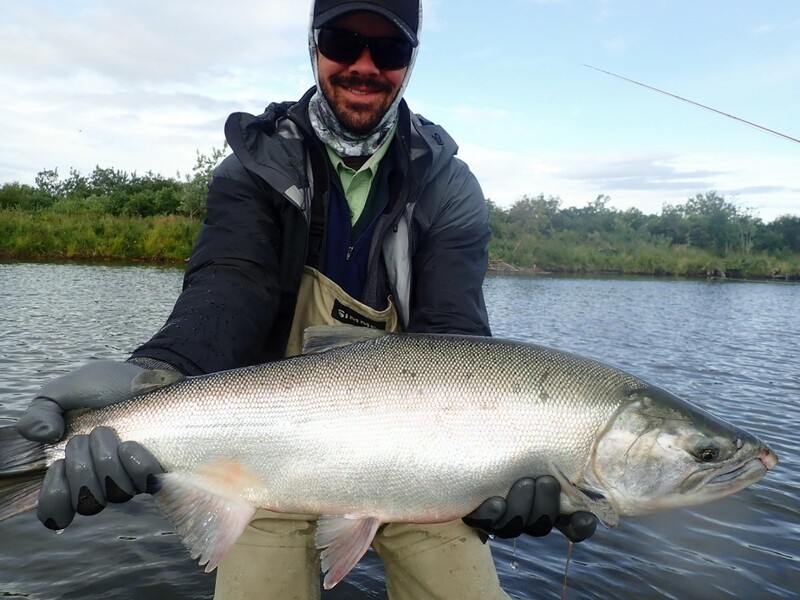 If one hit the bank the Coho took the fly as it dropped through the water column. If the cast was short, nothing. It was a challenge and over the course of a couple hours everyone had multiple hookups and indeed many had double-digit hookups. water at speeds not so common to fresh water fish. The Coho back is a deep emerald color and the flanks are polished silver. I netted for John and somewhere north of 20 fish I asked how he was holding up? He reported that his adrenals were perhaps depleted and he was losing feeling in his casting/ fish fighting hand. Reports from the rest of the gang were similar. They were fishing hard in paradise. We fished on and found a camp that allowed anglers lot’s of fishing options. The evening clouds flattened out as the temperature fell and we ate a huge meal of Coho Curry with Naan & rice and a salad. Savoring a glass of wine we sorted through our memories of the day remembering the family of 5 Mink, which scampered past us while we were in the Coho slough. Anglers returned upriver to that Coho slough and fished it as the sun set. Coffee was served during a lightning storm at 6:00am followed by pea soup fog! I’ve rarely experienced such a weird contrast of weather as that morning. We pushed off in thick fog and rowed the last miles to tidewater. The fog burned off by mid morning and then the fathers and sons and old friends hung out at the Quinhagak village airport awaiting their flights homeward” Good memories!